Charmaine Sheh Pursued by Female Manager? 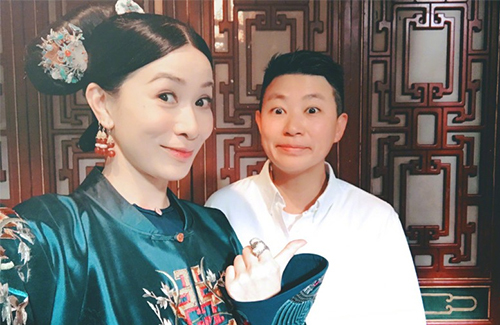 Charmaine Sheh’s (佘詩曼) manager Joanne Chan (陳早茵), daughter of actor Philip Chan (陳欣健), was a huge reason to why Charmaine accepted the offer to star in Story of Yanxi Palace <延禧攻略>. Some say Joanne may even be interested in dating her. According to a new rumor that is circulating among Hong Kong entertainment’s gossip circle, Charmaine—who played Consort Xian in the hit Chinese palace drama Story of Yanxi Palace—initially wanted to turn down the drama when she was first offered to star. Allegedly, Charmaine didn’t find the role too groundbreaking, as she has starred in a similar palace intrigue drama, the uber-successful War and Beauty <金枝慾孽>, back in 2004. It was Joanne—Belinda Hamnett’s (韓君婷) rumored ex-girlfriend—who convinced Charmaine to accept the offer. It was a choice Charmaine definitely did not regret—exploding with popularity throughout Greater China, Charmaine has earned over HK$60 million in the last six months thanks to the drama’s success. A source close to Charmaine and Joanne said they have gotten very close over the last few years. Joanne was available to take care of Charmaine 24/7, and she has been seen buying many gifts for Charmaine’s mother. The source added that Joanne may be interested in Charmaine, and that she’s trying to pursue her. 3 comments to Charmaine Sheh Pursued by Female Manager? Belinda Hamnett! Has she gone to China too, have not seen her for a long time on tv. What utter rubbish. Could be true but I dislike the insinuation. No man, get a woman. And please, Charmaine can do better than that if she wants a woman. Very strange reasoning. A manager relies on her artist’s work to earn a living so naturally, she would be nice to Charmaine and her mum and buy them gifts. Still not believing it until they show us more evidence. OTT, has Belinda Hamnett fixed her nose yet?